How much is my electricity REALLY costing and WHY? The desire to find this out has been sparked by talking to my neighbours, when I put my hand up to become a REPOWER volunteer, which is a community movement in the Byron Shire aimed to support and inspire us all to switch to affordable clean GREEN energy. We start off by showing householders this chart and then enquiring which energy provider they are with? 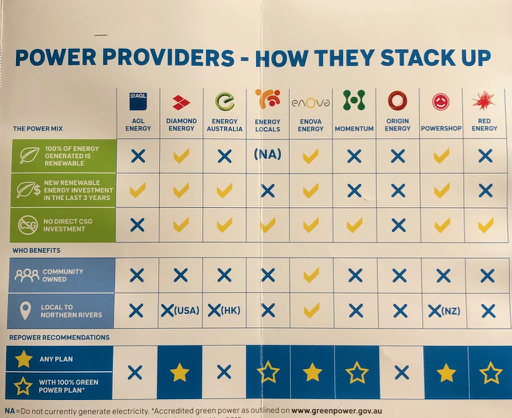 If they can tick most of the boxes they can get a Repower sticker for their letterbox and the opportunity to find out how to reduce their usage with a FREE ENERGY AUDIT from Enova Energy – our locally owned renewable energy company. We decided to use Enova as our energy provider some time ago. WHY? because they are committed to using GREEN energy and they plough back 50% of their profits into local renewable power projects and community education. They are also owned by Australians – unlike many of the power companies that are owned by overseas interests – like the now misnamed Energy Australia which is owned by interests in Hong Kong and contributes very little to the local economy. Enova’s prices are also competitive – although not the cheapest. BUT, WHAT DOES BEING THE CHEAPEST REALLY MEAN? SUBSIDIES “People may think they are getting cheap power but the big power companies that are using fossil fuels – like AGL, Energy Australia and Origin get about 10 billion dollars in subsidies from the government, every year” A quote from my ninety year old neighbour. This certainly got me thinking and trying to find out more – could she be right? Unfortunately she is – except it’s worse. 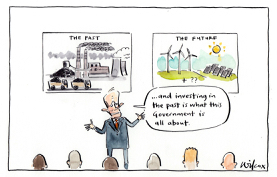 Each year the Australian government spends $12 billion of our money on programmes that encourage more coal, gas and oil to be extracted and burned. 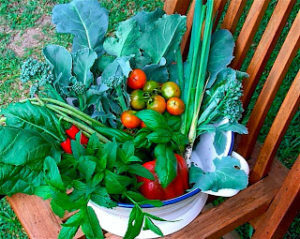 SUBSIDIES In 2017 the population of Australia was 24.6 million. This means that for every woman, man and child the government hands over $487.00 to the fossil fuel industry – every year. Money that could be spent on health, education, public transport …………. Australia has built a bad reputation as one of the world’s biggest supporters of the fossil fuel industry. This was reiterated when Australian delegates refused to sign the Paris Agreement – the United Nations Convention on Climate Change – that would phase out fossil fuel subsidies. Priorities are seriously skewed when the interests of the big polluters are put ahead of the health, climate and environment of Australia (and those of our planet). So now we not only have a shameful global reputation for the way we treat refugees – we also have it for the way we treat the planet too. From conversations I had with folk on my recent travels overseas – this does not go unnoticed. I got asked on several occasions “What has happened to Australia”? I ask myself the same question. POLLUTION And now the story gets even worse. 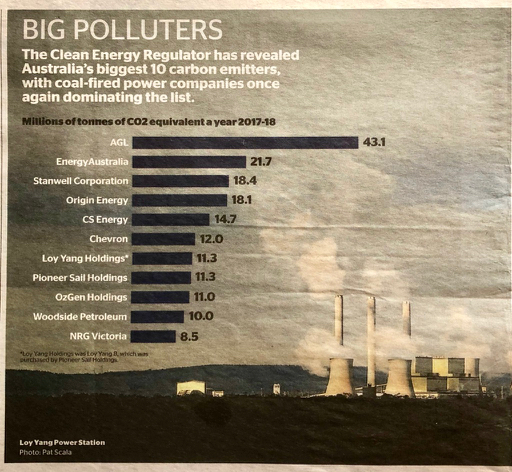 This article and graphic depiction of the big Australian polluters, in terms of carbon emissions, shocked me. Take a close look at who they are – the BIG THREE energy providers (AGL,Energy Australia and Origin) plus companies like Stanwell Corporation – a Queensland energy provider – all as a result of their coal-fired power generation. That cheap coal power is beginning to look very expensive indeed. How does it actually stack up against renewables like solar, wind and thermal? A landmark study has shown that renewable energy has reduced electricity prices by far more than the subsidies paid for it. (Independent study by the Victorian Energy Policy Centre, December 2018). An example of this is rooftop solar – in case you were wondering about the true value and cost of the solar rebate scheme to householders – it very quickly pays for itself, by generating your own electricity and reducing the overall price of electricity when you feed the surplus into the grid. The feed in rate with excess solar power generated is around 10-20 cents perKw, but the buying rate, from most companies, is around 30 cents perKw. For doing just about nothing at all, disparity in pricing is creating wealth by reducing the cost of electricity for resale. So ask yourself this question – wouldn’t it be better to be creating profit for an ethical company? “Cold, hard numbers show that renewable energy is, and will continue, to supply cheaper electricity than new coal fired power plants.” (Stephen Long, ABC News, 2 September 2018). In the same piece these prices are quoted. Electricity generated from the Stockyard Hill Windfarm in Ballarat is $55 per megawatt hour – which is a similar price for commercially generated solar. AND, according to Goldman Sachs, wind and solar power prices will fall by between one-third and 43 per cent by 2025. In contrast, coal generated electricity costs around $137 per megawatt hour – and is steadily rising (Bloomberg Finance 2018). CONCLUSION It costs more than double to produce coal generated electricity over renewable, but the cost to the consumer is ARTIFICIALLY DEFLATED as a result the enormous handouts that they receive from the government. If this makes any sense to you, you are doing better than me. RENEWABLES v FOSSIL FUELS. The numbers don’t lie AND THE SCIENCE IS UNEQUIVOCAL so why aren’t we doing more to halt climate change? I am writing this on the day when Environment Minister Melissa Price, has given the go ahead for the water licences for the mega Adani coal mine – the ramifications of which are unthinkable. This is the same Minister that stated that the eminent authors of 6000 scientific papers “had got it wrong” and that lower power bills were more important to her government than cutting pollution and reducing global emissions. 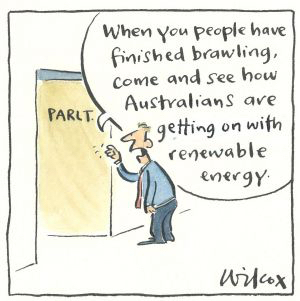 So while Australia, and the planet, need leadership that embraces the future and sets us on a new course – we get this – a decades long CLIMATE WAR that has become a CULTURE WAR. Right wing economics GOOD – Green, sustainable future BAD. And, while the electorate allow the government to be constantly feeding their ideologies and bank balances – nothing will change. In 2017-2018 fossil fuel companies donated $1,277,933 to the LNP and Labor (estimated to be higher through non-disclosure). You have to ask yourself – how much bang do they want for their buck? The Prime Minister, Scott Morrison’s Chief of Staff, John Kunkel, is the former CEO of the Minerals Council of Australia – the man who provided the PM (then Treasurer) with the famous lump of coal to wave around in Parliament. So, we have one of the most influential advisers in Government a pro-fossil fuel advocate. Sigh ………….. The International Energy Agency says last years carbon emissions in Australia from energy alone rose by 0.7 per cent to an historic high of 550 million tonnes. So in spite of everything we know and are experiencing with climate change – we, and more especially OUR GOVERNMENTS, are not doing enough. BECOME PART OF THE SOLUTION – SWITCH TO GREEN, CLEAN, CHEAPER ENERGY.